On Friday, the morning of the women’s final between Navratilova and Evert, the air is cool and crisp; the packed galleries of the Centre Court hum with anticipation. The women exchange breaks to start the match, then play the next few games lightly and elegantly. 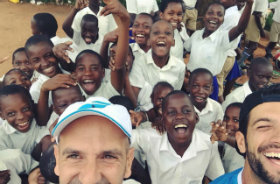 It is elevated, pleasant tennis, free of corrosive personal antagonisms. Breaks in the sixth and eight games give Evert the first set. The match is reminiscent of the Navratilova-Goolagong semifinal, with the Czech again taking the first game of the second set. Again, she is extended in the next game. But this time she mistimes an easy overhead at deuce and misses the ball completely. Disconcerted, she hits a poor volley and is handily passed by Evert to give the break back. But the overhead blunder awakens Navratilova. She takes Evert’s serve at 15 in the next game and then holds at love. 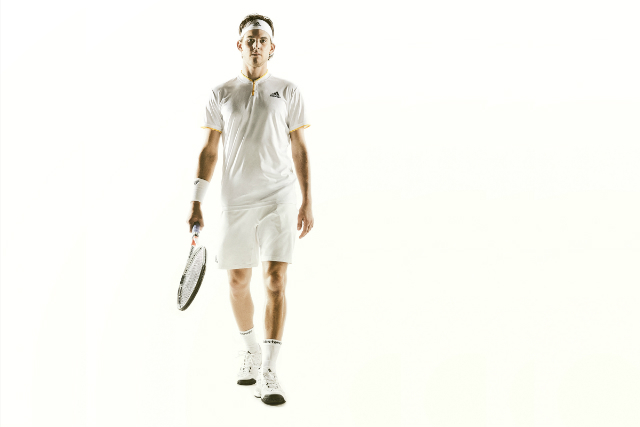 The match has climbed a level; the ethereal beginnings have yielded to tennis that takes on increasing grandeur. Evert holds to trail, 2-3. At 15-30 in the next game, with both players at the net, Evert hits a backhand volley that strikes her opponent in the head. Navratilova collapses, more from embarrassment than pain. When she gets up, smiling, Evert is waiting at the net to give her head a friendly rub. Again, the fluky occurrence stimulates Navratilova’s game. She forces Evert into an error and then makes short work of an overhead to reach deuce. Although Evert wins an advantage point, three crushing volleys by Navratilova take the game. There are no more breaks; Navratilova takes the second set, 6-4. Evert begins the final set with a tentative game; a double fault for 15-30 and a flurry of errors give Navratilova another break. Two games go by routinely before Evert stirs again, holding four break points against her opponent. 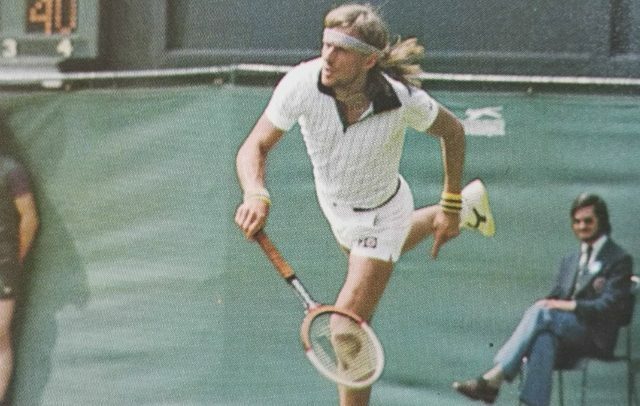 The game is a classic, with Navratilova’s booming serves and forcing volleys offset by Evert’s uncanny anticipation and precise passing shots under acute pressure. In the end, Evert finally gets the break when Navratilova floats a sliced backhand approach shot too deep in her eagerness to get to the net. 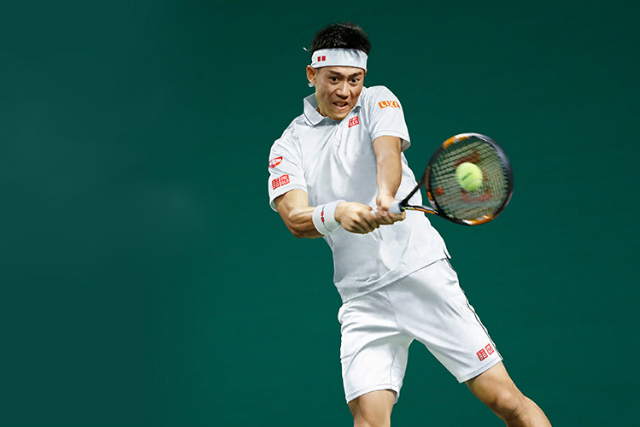 It has become one of those matches in which breaks cease to matter because the level of skill is so high. Although Chris breaks again for a 4-2 lead, Martina is unflappable. It seems as if this match will go to the player who mounts the most furious assault through the closing games, and that proves to be Navratilova. She hits her peak with a love game that levels the score at 5-all, and she takes twelve of the last thirteen points. Evert simply lacks the mental and physical stamina to stay with her, and when Navratilova hits yet another winning backhand volley right to the corner of court, it is over. 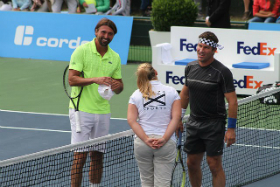 While club officials unrolled the crimson carpet for the presentation ceremony, Evert and Navratilova stood by the umpire’s chair. “How come you’re not crying?” Evert asked. 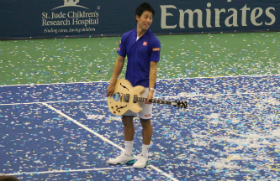 “I did, the first time,” Evert said. 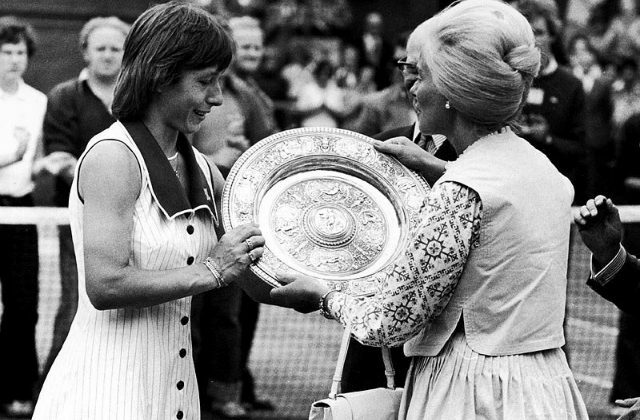 When the Duchess of Kent presented the trophy, she offered to assist in Navratilova’s efforts to win travel privileges for her parents. Nobody on earth can conduct a ceremony as briefly and decorously as the English. Within minutes it was over. When Navratilova came to the pressroom, she was surprisingly coherent. She said she did not know whether to cry or laugh; all she wanted to do was share her joy with her family, whom she would call later. She felt a chauvinistic flush of pride, the first since her defection, because she considered her victory a triumph for the Czech people. By the time the formalities were concluded and Navratilova returned to the Inn on the Park, the champion was able to get right through to her parents on the telephone. The televised image of Martina was the first her parents had seen of her in over two years. 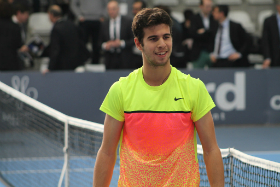 However, the first topic of conversation between Martina and her father was the forehand volley. He told her that she was starting her backswing too high. She laughed and told him that she wasn’t calling for a lesson. The sign on the railroad platform reads Southfields – alight here for Wimbledon tennis. Upstairs, newspaper vendors crowd the sidewalk, each wearing a sandwich board advertising one exclusive or another pertaining to the chances of “Our Ginny”, “Stormy Ilie”, or “The Mighty Man from Michigan”. A long line of black taxicabs provides transportation to the grounds of the All England Lawn Tennis and Croquet Club, two miles away. Traffic thickens as you approach Wimbledon. Soon you see a long queue that has formed in the predawn hours at the wrought-iron main gate of the club. 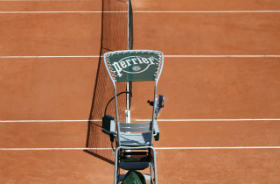 When the cab pulls up, a ticket tout opens the door and offers a pair of Centre Court seats a twenty-five pounds each. The markup is still a modest 500 percent; by final days the seats will fetch at least £100 each. 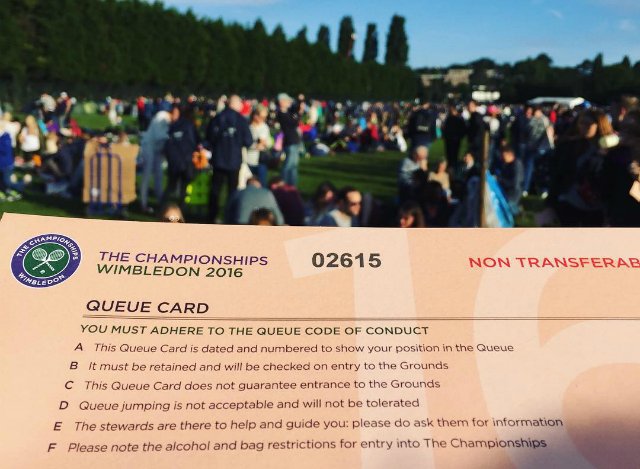 The fortunate people at the front of the queue have a chance to buy one of the 300 Centre Court seats that are available to the public daily, but the vast majority are waiting to purchase grounds passes that do not guarantee seating anywhere. If you have tickets or the proper credentials, you pass through the gate beneath the club crest, the green-and-mauve club flag, and the Union Jack. Inside you have a choice of wandering about the field courts, hoping to get close enough to watch part of a match, or going directly to any of several other queues. 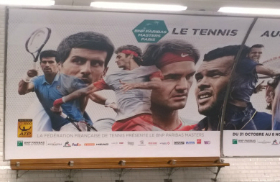 One is for standing room alongside the Centre Court, another for the handful of seats available for Number One Court. The bleachers at the other six show courts are filled fifteen minutes after the gates open at noon. Many spectators spend the better part of the day standing in line both inside and outside the grounds. 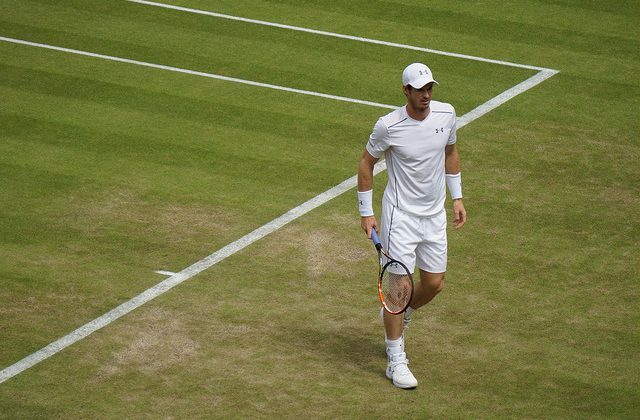 The critical attendance point at Wimbledon is 31,000; it is exceeded almost every day. 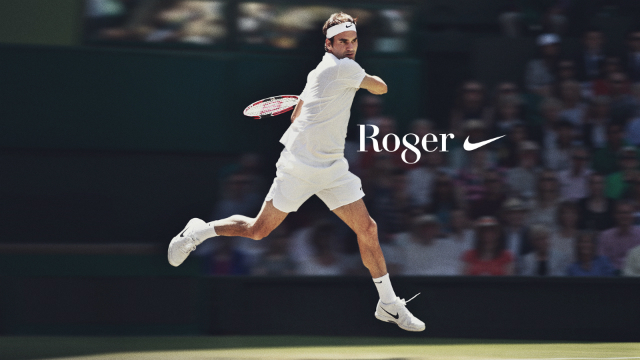 Every few moments, the main gate swings open to admit a vehicle, usually a delivery truck, a Rolls-Royce bearing royalty, a Wimbledon courtesy car, or a rented limousine carrying players like Connors or Gerulaitis. Over three hundred competitors are eligible for official transportation. A few years ago, the club maintained a fleet of elegant Daimlers to ferry players back and forth from their London hotels. Now the job is left to British-Leyland, which uses fifty sedans and as many drivers. These courtesy cars are painted to advertise the tournament and the automobile company. Wimbledon is gigantic in spirit, but the grounds cover just about ten acres. Stewards check the ebb and flow of spectators at each court; inside the clubhouse an electronic counting device registers the click of each admission turnstile. 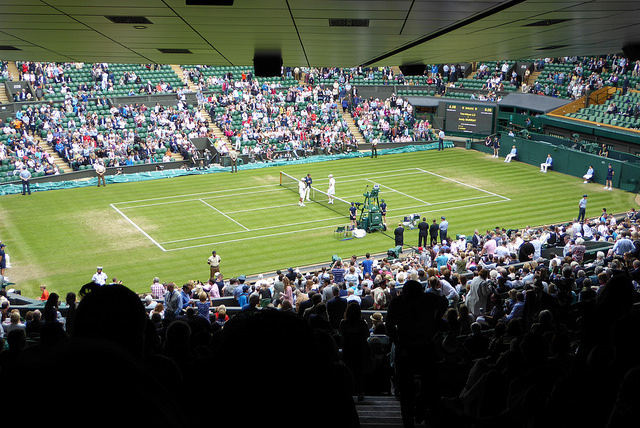 Each afternoon, a committee of club men wearing green-and-mauve ties surveys the crowd from the balcony above the main entrance to the Centre Court. They decide whether to keep the gates open or shut them down for the day. Then they adjourn for tea. The Centre Court is an eight-sided edifice connected to the rectangular Number One Court by a common wall. 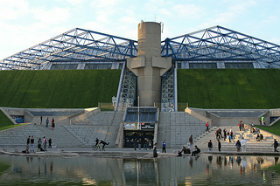 The complex looks as if it has been pieced together from odd scraps of steel and random slabs of concrete. It is a maze of cream and loden halls and staircases rambling in myriad directions, with ivy-covered walls and window boxes of blue and pink hydrangeas. 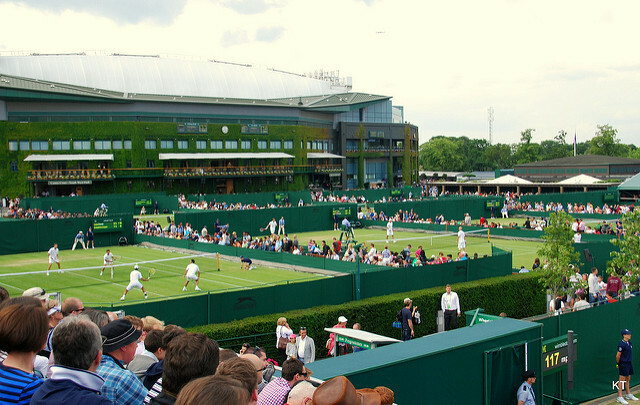 The focal point of the grounds is the large scoreboard opposite the Number One Court enclosure. This enormous green panel, which bears the legend of results and the schedule for each court, faces the players’ tearoom. Spectators on the macadam walkway below can look up and spot the contestants through the tall glass windows or on the balcony above. There is a public dining area near the main gate, flanking a small grassy picnic area. A variety of tents house bookstalls and souvenir shops, a Pimm’s bar and the famed strawberries and cream concession, as well as a gallery of food and beverage concessions built into the side of the Centre Court. 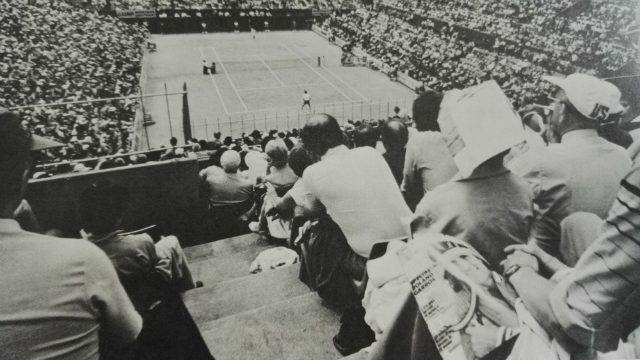 A sloping roof extends over most of the seats in the Centre Court, leaving only the standing room along either sideline exposed to the elements. The roof adds intimacy and turns the most significant piece of sod in tennis history into a stage suitable for Elizabethan drama. Number One Court is covered at both baselines and where the east stand is a towering structure that adds a breathtaking quality to the court. 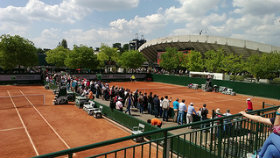 Courts Two, Three, Six, and Seven, directly across from the main enclosure, also have grandstands. The only other show court is Fourteen, in a distant corner of the grounds. 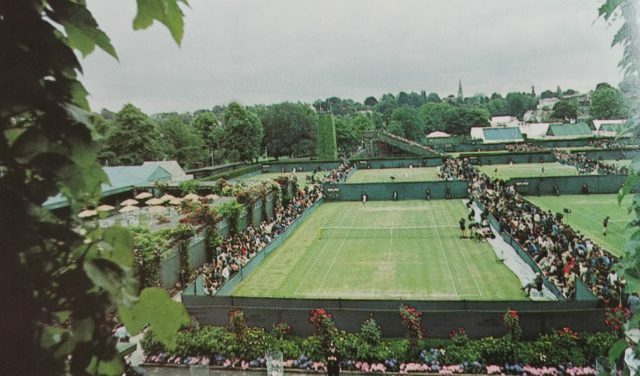 The rest of the twenty-three courts are divided by low fences, narrow walkways, and tall hedges reminiscent of the mazelike gardens found on baronial estates.